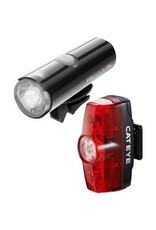 This Cateye Volt 400 XC/Rapid Mini Light Sets offer longer battery life and a far smaller size than ever before. On the front, the Volt 400 XC light provides three modes with run times varying from one to 20 hours depending on the mode. Thanks to Cateye's Opticube technology, the 400 XC is able to offer a wider field of vision than ever before as well, boasting 180˚ of peripheral visibility. Both the Volt 400 XC and Rapid Mini have integrated USB charging ports that offer rapid recharging by simply plugging the light into a computer's USB slot.